Trip Type: Specialist Photo trip, 1 week bespoke itinerary on my own plus 1 week organized specialist photo trip (the second week was organized by Photographers on Safari and the whole itinerary was arranged by Wildlife Trails using their Indian agent Perfect Travels). Equipment: Nikon D200/MD-200, D300/MD-10, Nikkors 70-200/2.8, 200-400/4, 17-55/2.8, TC-14E, Wimberley WH-200, Gitzo GT3540XLS, SB-800 (+ homemade bracket), SD-8a, + laptop, readers, duplicate ext. hard drives, etc. 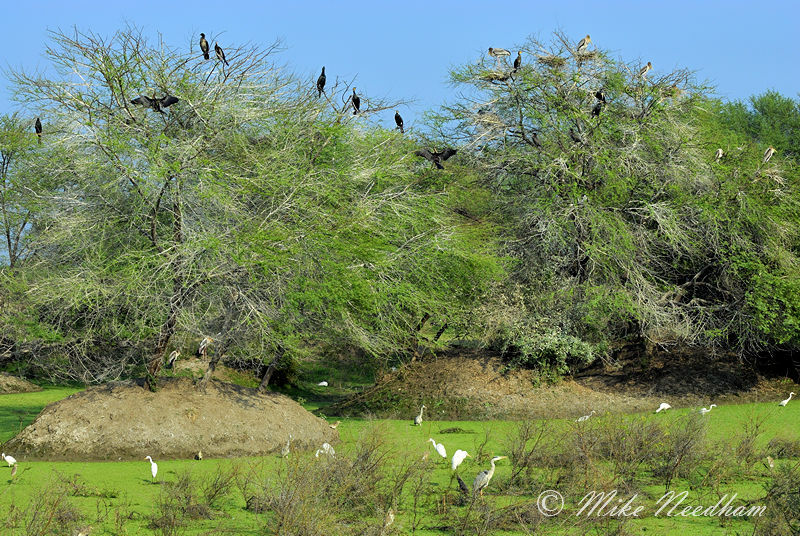 I have to confess my first impressions of Bharatpur were rather negative, if fact I remember thinking "omg!, what I am going to do here for two days?". 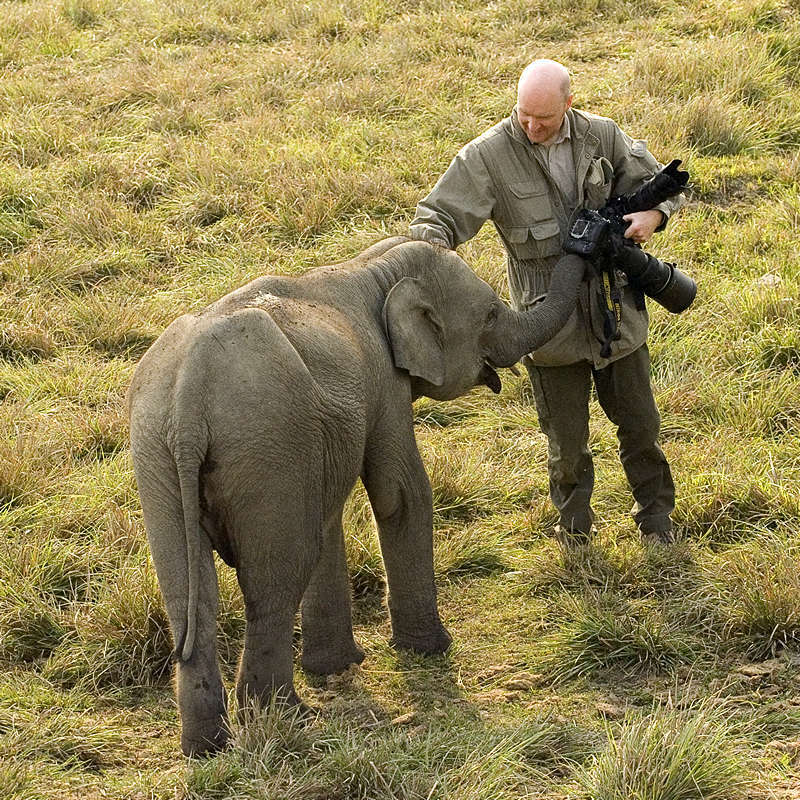 I had met my guide at the hotel, a short 6-7 minutes drive from the NP entrance so we were quickly on the spot. Once all of the formalities were sorted at the entrance gate, which always seem to take an eternity, we started to walk into the park. It was about a 40 minute walk (probably 90 mins from where I would be starting off on subsequent visits but the guide was able to take the car part of the way on the first day) to the heart of where the birds were at. The area was so dry, and considering that it is a World Heritage Site wetland, my heart was the only thing sinking (or likely to). But as we got deeper into the reserve there was some water in the end 'ponds' and there were quite a few birds around, mainly herons, egrets and storks of various types. It must be a truly amazing place when it is fully flooded and full of waterfowl, but I understand that has not happened for 10-12 years. The guide claimed that the low water was probably due to global warming, the more plausible reason I have heard elsewhere is that much of the water is being diverted to agriculture before entering the NP. Whatever the reason, the park was clearly only a shadow of its past self. It is also worth pointing out that the various water fowl, something that the park is famous for (it was originally made for ‘sport’ shooting), typically leave this, their over wintering ground, in February. Therefore I had just missed that spectacle by a week or two. Although, the few that were left (I saw a total of about 6 ducks!) were incredibly shy and skittish and not at all as approachable as their British cousins, this was also true of the ducks and geese that I encountered on the Chambal River. 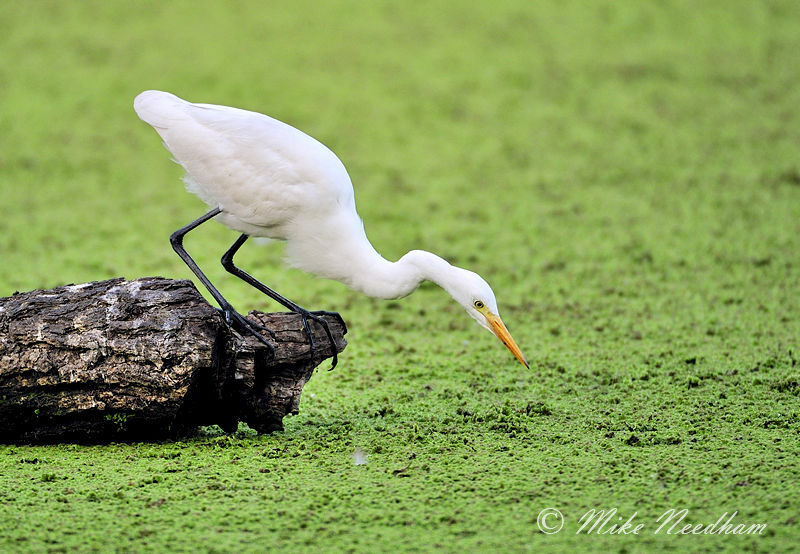 The main breeding season for the herons, egrets, storks, etc. is mid summer when it is very hot and wet. The guide and the excellent rickshaw man I used on subsequent visits, both said that November too was very good. Certainly if I am ever in this part of India at that time of year I will try and fit a couple of days at the park. I spent the next couple of hours getting some good record shots of the birds before returning to the car via a rickshaw. The rickshaw was definitely the way to go, walking was lovely and great exercise, but it simply took too long to get to where the action was and back again, loosing too much time and good light. I found that the best approach was to hire a rickshaw (I liked the first one I got and so informally agreed to use him on subsequent visits and so built up an understanding with him) and use it to get into the ‘action’ part of the park. I would hire the man for the whole of each visit but would leave him to go off and get a cup of tea or chat with his buddies whilst I explored a little on foot. Other times I would wonder ‘off piste’ with just a camera and lens and leave the rest of my gear on the rickshaw with the man. A little atypical for me, I never usually let anything out of sight but I was confident in the relationship I had with the rickshaw man. I found this worked really well and gave me a little extra freedom. I would certainly recommend that you hire a rickshaw if you ever go the Bharatpur (to be more correct it is actually Keoladeo Ghana National Park but most people know it as Bharatpur NP), find one you are comfortable with and agree to use him for subsequent visits. Mine certainly seemed to appreciate the certainty of income and would bypass other punters and make a beeline to me. I don’t remember the exact cost but it was just a few USD per visit (and a little something extra at the end as is the norm and appreciated, but not necessarily expected). He was also a good ad hoc guide, he had a keen eye and also knew where to look for roosting owls etc., I would not have found the little owlet in a million years on my own. Anyway, the next morning I found my rickshaw man and headed into the park as soon as the gates were opened. Once I had my bearings and realised that any pictures would need to be earned rather than being presented on a plate, I really enjoyed the next 3 visits to the park and was rewarded with some lovely pictures and a truly magical experience. I spent quite a lot of my time walking the back lanes away from the heart of the park. There were fewer birds and animals here, and they were more wary too, but you could easily not see another human for an hour or two, quite something considering how small and busy the park was at times. But strangely most people stayed on the main track and did not venture down some of the other routes. 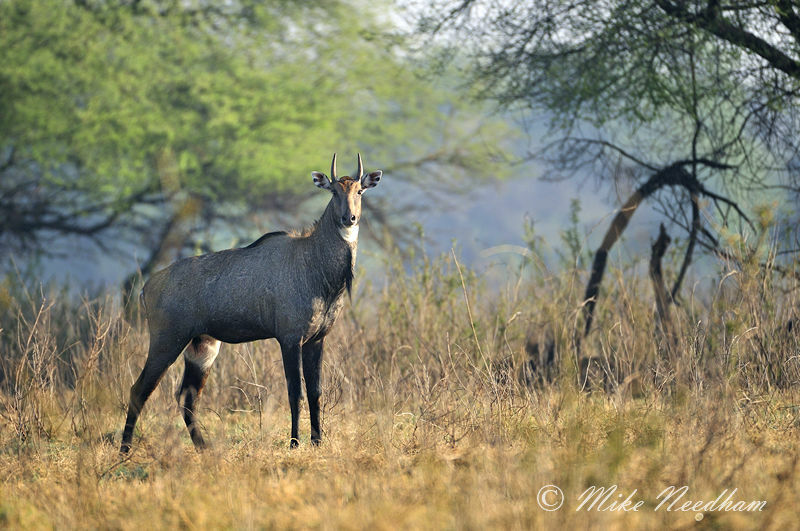 In doing this I found a couple of male nilgai in a pasture area which allowed me to approach much closer than I had expected. I made sure that they could see me from a way off, and then I slowly and indirectly approached. There is little chance of sneaking up of truly wild animals, as these were, and if you do they are off as soon as they are away of you. In such instances I often take the opposite approach and rely on the animal’s desire to keep you in sight added to a little curiosity. This resulted in some nice shots and was great fun. 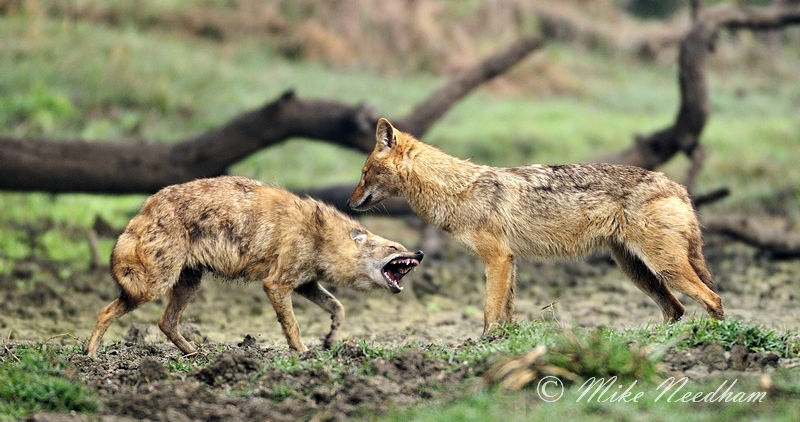 At the end of the 4 trips (2 mornings and 2 afternoons) into the park I had amassed quite a collection of pictures of birds, antelope (sambar, nilgai and chital all shot), jackals, etc., but it was the jackals that were the highlight, probably of the whole trip. I'd spotted a couple of them on the first afternoon whilst down one of the main side tracks and then again the following morning in roughly the same area. They were on one of the dried out and heavily cracked dried out pond beds with small raised 'islands' of vegetation. I thought that they must have a den near by and thought little more of it. That is until I spotted the bull. He was very large and very dead, and the jackals looked to have been feeding on the carcass probably for no more than 12 hours or so as >90% of it was intact. I am fairly sure that it wasn’t there the afternoon before so can only guess that he was in the area and dying somewhere just out of sight, and it was this that had attracted the first jackals that I had seen. The carcass was between two of the ‘islands’ in the general area I had seen the first jackal, and about 100-200 metres from the raised footpath where visitors walked (obviously the area where the bull was should be flooded). The second afternoon, when I spotted the bull, I decided to try to get closer on foot. The jackals were very nervous and would not allow me within 100m of them. 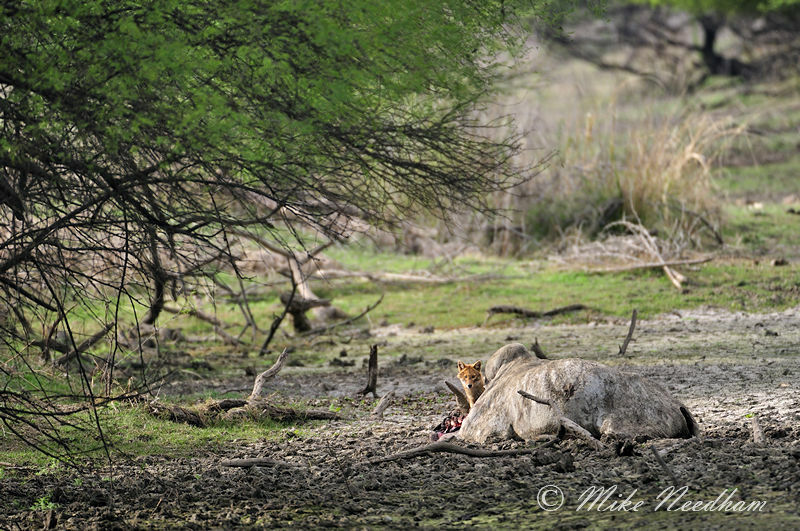 So, I sat by the carcass (about 20m away and not down wind!) for an hour or so making sure that the jackals knew I was there and not trying to hide (that would just make them more nervous and they would know I was there anyway). They were clearly torn between wanting to flee, curiosity and wanting to feed on the mountain of ripening beef. Being able to leave most of my kit on the rickshaw really paid off here. 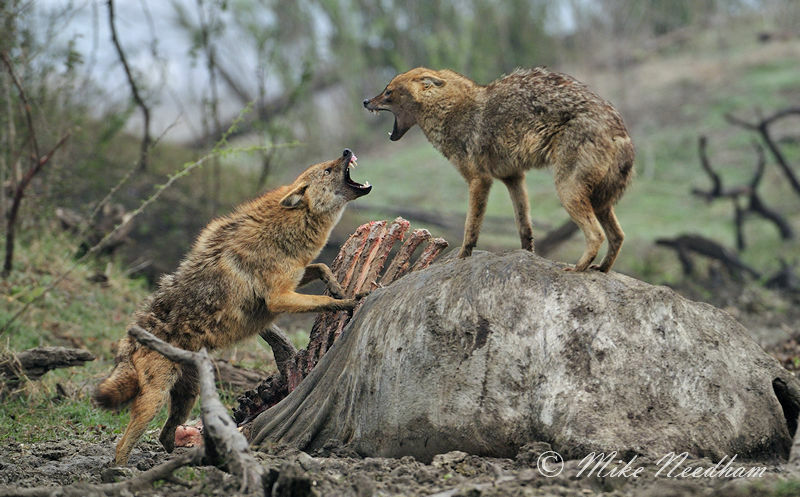 It was interesting how each jackal (there were 2 or 3 at this stage, later there were six or more at any one time in the area around me) had its own personality, and with it differing degrees of tolerance for my presence, and indeed each other. Eventually, a bolder and clearly dominant one cautiously approached the carcass and started to feed, regularly looking up to check that I had not moved. The others stood off at various distances and would not approach the carcass. After an hour or so, and a number of photos, I decided to leave them in peace. The next morning (and my last visit) I headed straight to the carcass (stopping off only briefly to photograph some juvenile painted storks), approached in full view again but kept low and quiet. There was about 75-80% of the carcass remaining. Over the next 2 hours or so the jackal gradually allowed me closer and closer until they were feeding and interacting with each other seemingly quite normally with me only 10-15m or so away, and allowing me to carefully change positions. That morning I got my favourite shots of the whole trip, one jackal on the top of the carcass, another approaching submissively, both snarling at each other. Pictures aside it was a wonderful experience to be on foot and so close to them as they went about their business. When there is clearly not enough food for both of you (!) there is no alternative but to fight for your meal! Painted stork, low light, high ISO and moving. Not a good combination! 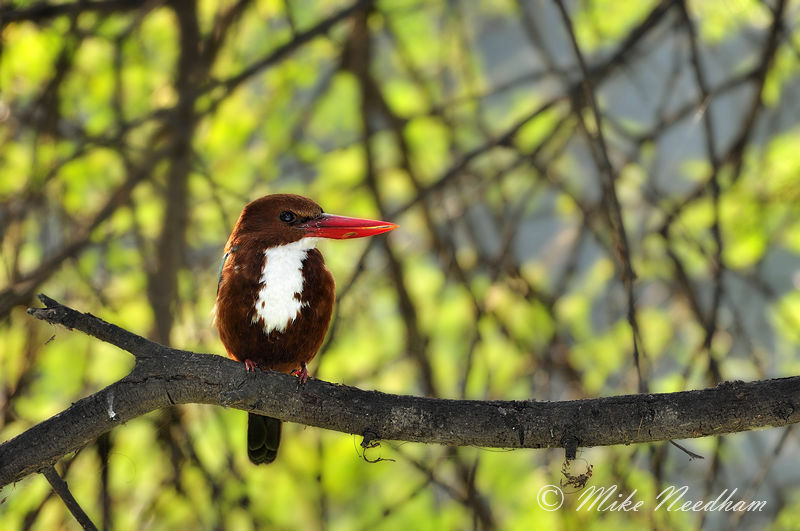 Bharatpur may be a “bird park” but I certainly found a lot of other things to photograph too. I would have given anything to have an extra day or two there, what a turn around from my first impression of the place. But it was time to move on and see what the Chambal River would have to offer. When I arrived at Chambal River it was very much like I had imagined. The water level was low (that became more evident a couple of days later) and the boats, small 10-12ft shallow drafts with an outboard, were at the waters edge several hundred meters across the dried river bed. After the usual faffing around by the guide and boatman for no apparent good reason I was eventually in one of the boats, just me, the guide and the boatman, and heading up river. We soon got a fleeting glimpse of a river dolphin, a local speciality, a few hundred feet away which the guide got terribly excited about. However, I had decided pre-trip not to go chasing pictures of these elusive creatures and waste valuable time in the process. My focus was solely of finding gharial and I had made this clear to the guide back at the hotel, in the car and whilst getting in the boat. Despite my direction he took every opportunity to point out every tiny little bird, we also stopped to look at several Bengal Eagle Owls roosting on the tall muddy cliffs. They were lovely to see but much too far off for a decent picture. And they were not gharial. I took a few snaps out of politeness and we moved on. At this point the guide was telling me that only that morning (that old chestnut!) 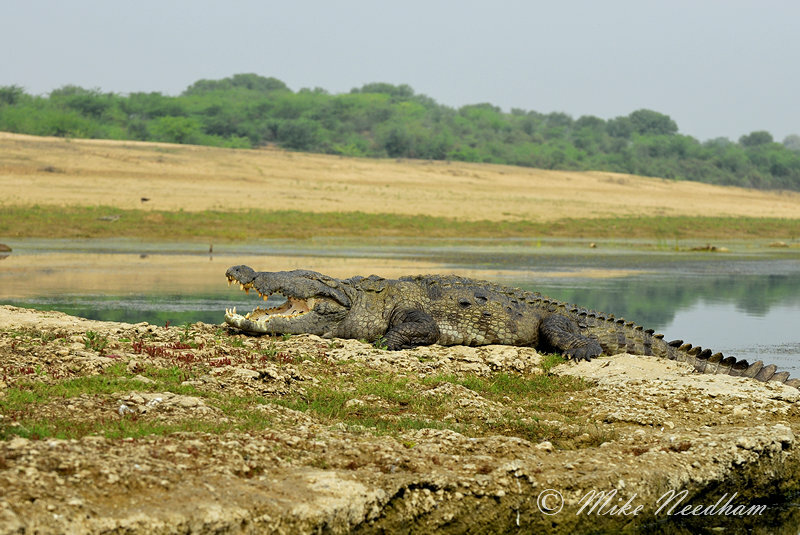 he had seen around 70 large gharial basking. My hopes were raised a little but I would remain sceptical until I saw them for myself. Sure enough, eventually we did see one, about 3 or 4 foot long (quite small, these animals can grow to 20+ feet! ), which slipped into the water after just a few shots. I was a little disheartened but at least they were there, the guide too reassured me that they were there and that we were not seeing them due to the overcast conditions. "They only come out when it is really bright", I think it was probably more to do with temperature than light levels but I smiled and nodded. The main basking areas used by the gharial were rocky outcrops in the middle of the river that would be soon engulfed as the water level rise in the wet season. The main river course was still very wide even at this time of year, perhaps 50-100m in places, but was only 6 to 10 ft deep for the most part. But despite the crystal clear waters, the river bed was not visible due to the thick vegetation which could have easily hidden 1000s of huge reptiles. The outcrops were only a few hundred metres up stream of our launch site, and so reaching them was very easy, if a little time consuming, but here was nothing much around. As we headed back, a pair of Boneli's eagles which we had seen up on the cliffs on the way out were drinking at the waters edge that produced some nice pictures. There was also an osprey overhead, but too distant for a decent image. These and a few other sightings kept things interesting if not particularly productive. The next morning I needed a clear sky and some warmth to the air. The next morning we set off quite late, I would guess around 7am, and by 7:30 we were at the river. To get to the river we took a right turn in a nearby village, off the ‘main’ road, and about 1-2 miles down this road we entered a zone of sand dunes and mini canyons cut into the hardened sand. I say mini, they were about 30 - 40 feet deep, maybe more, and created specific habitat that separated river from land. 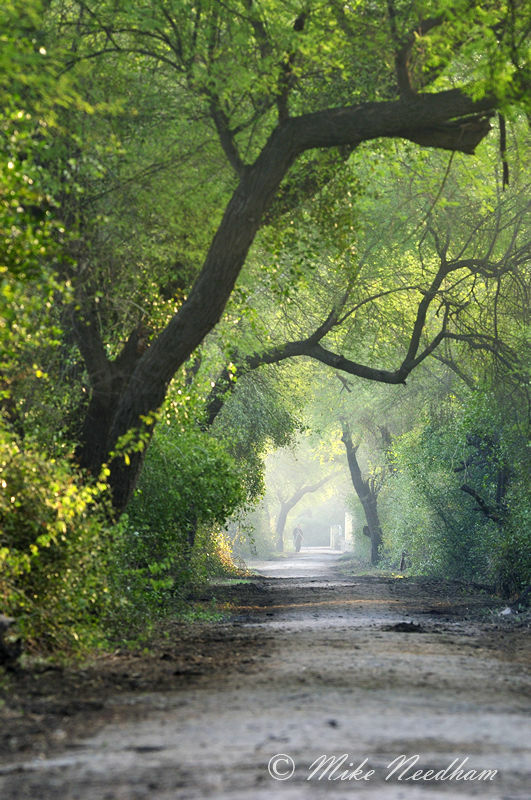 This was the main track to the river crossing used by the locals their animals. The tarmac then ended and a temporary track ran the last few hundred metres to where I got in the boat. At the boats there was again absolutely no urgency to get going but, now knowing how close the basking area was and the fact that the warmer (later) it got the more chance we would have of seeing gharial, I was reasonably chilled about everything. 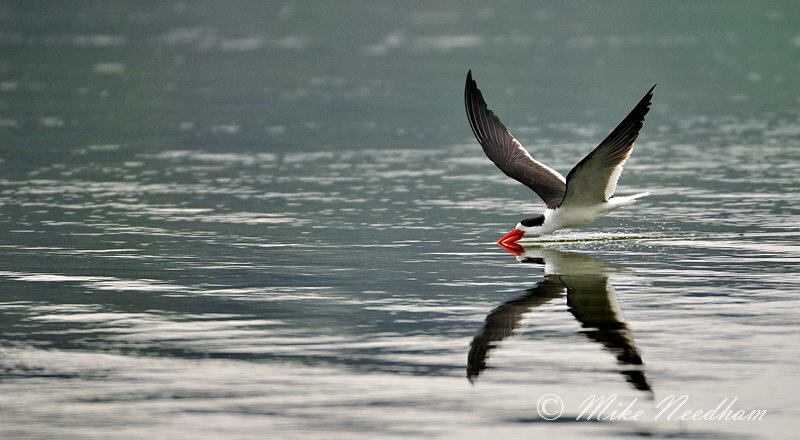 I kept myself busy trying to photograph some of the many small birds busying themselves at the waterline. The sun was climbing from behind the crossing point and burning a beautiful diffuse golden light through the early morning mist. I sat on the bank watching it, thinking what a wonderful sight (i.e., picture!) it would have made earlier when the locals we had passed on the access track would have been crossing the dry river bed in the mist with their camels carrying loads of vegetation of some description. No sooner had this thought saddened me for what I might have missed when a couple of fully laden camels and their masters started to head down the far bank towards the crossing point. My mood quickly changed and I set to getting my camera ready should they start to cross. I couldn't be THAT lucky, surely? But I was, they started to cross, and I was ready. Many frames later (one of which subsequently won the Warehouse Express May photo competition, my first every competition, see here) we got into the boats and headed up river. 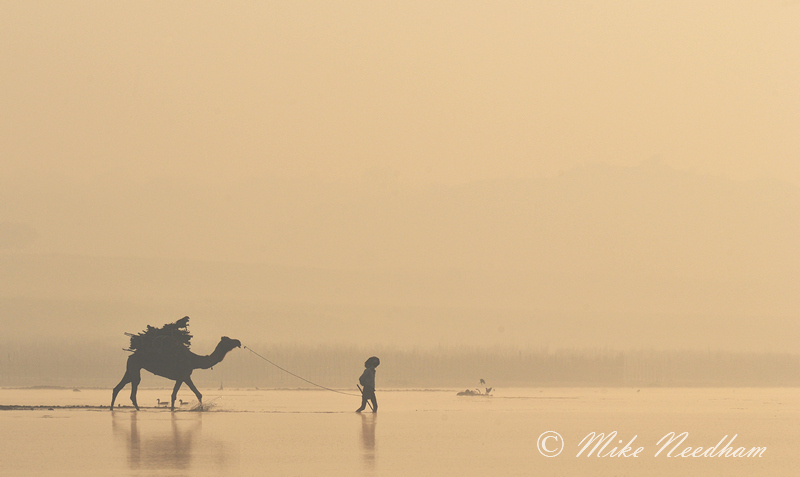 The Nikkor 200-400mm was a perfect choice, giving me the flexibility to crop or pull back from the camels without moving. The day had been a success before it had officially started! The sky was a little overcast but it was bright and warm, it was certainly enough to bring a few gharial out for me to get some nice shots and to judge Chambal as a success. 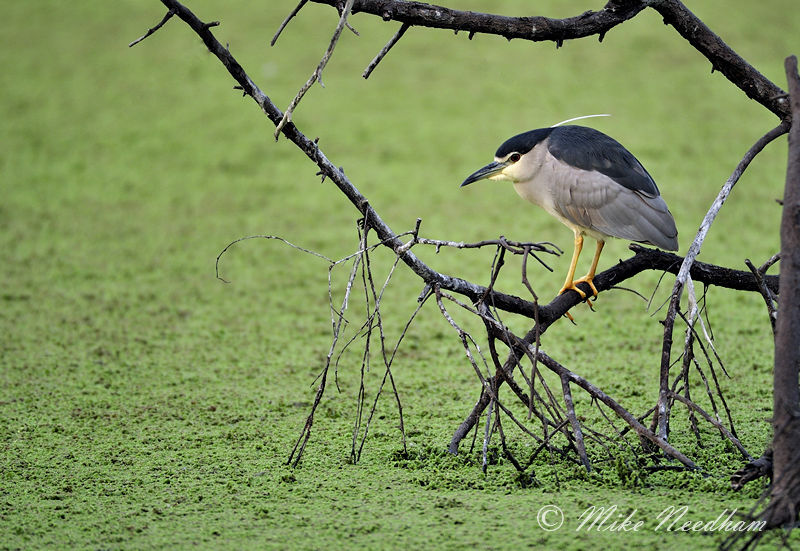 I also spent time at a colony of small birds in the middle of the river some way further upstream. 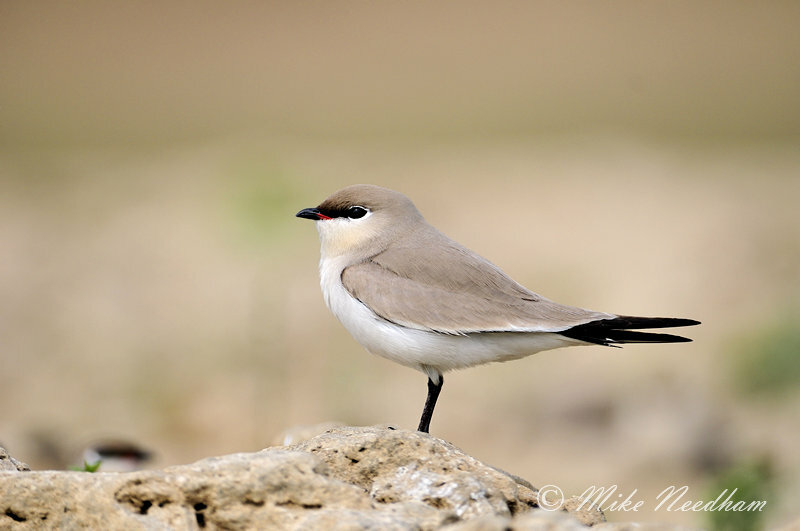 Apparently ‘twitches’ come from all over the world to see these birds (pratincole), they were certainly very photogenic. That afternoon I headed into the farmland away from the river, a reasonably long drive not helped by the 30 minute wait at a level crossing for 3 trains to go through! The afternoon was spent cruising the roads and lanes looking for sightings of cranes off in the crop fields. When we spotted one (actually they were usually in pairs) we would pull over and I would head off on my own to try to get close enough for a picture. The birds were a little wary but with care they could generally be approached to within range of a 400mm. 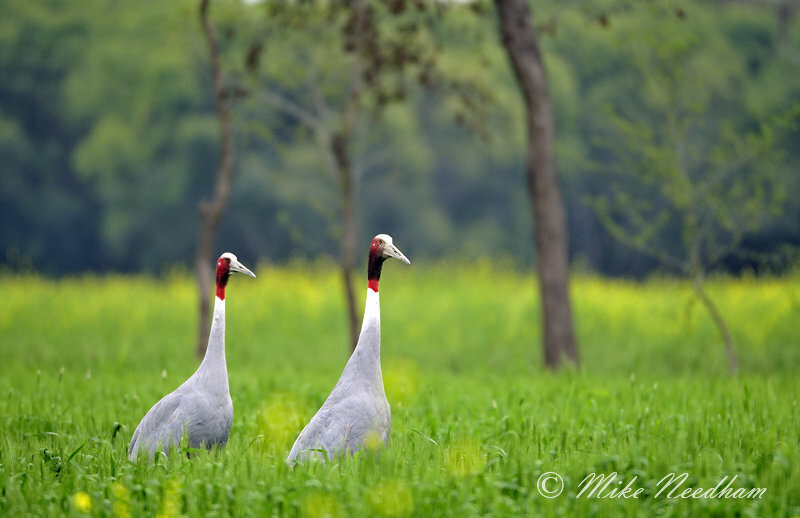 At the time the opportunities didn't seem that good but I ended up with some respectable pictures, nothing amazing, but certainly better that anything I could have hoped for of Sarus Cranes at Bharatpur. All in quite an enjoyable and productive day. 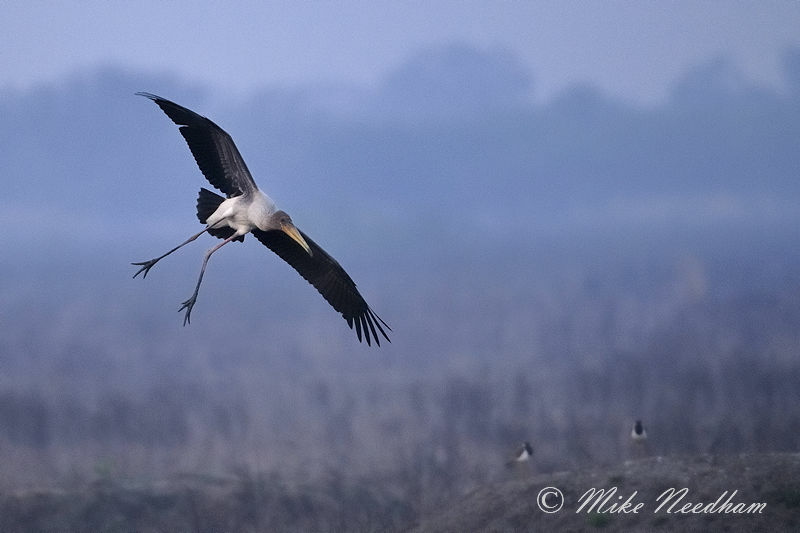 The next morning I set off well before sunrise as I had decided that we would head the other way on the river and look for the Indian skimmers, another local Chambal speciality that I was hoping to capture. Due to the low water level the boat could not get past the crossing point with the guide and me in it, so the boat met us on the other side and we walked the couple of kms across the soft sand to meet it. It was actually really nice to have the walk. We set off down stream and it was immediately clear from our less sedate pace to the previous day that this would be a longer journey. We saw a few things en-route, the highlight of which was a jungle cat on the bank. How the guide spotted it I don't know but it seemed unfazed as we tried to drift in closer to the shore over the dense water weed. It was clearly still looking for breakfast and we tracked with it along the bank for 30-40 minutes. Luckily we were all heading the same way and it produced quite an amazing experience. At the skimmer nesting site there were about 60-70 birds, they had not nested at this point and were at the early stages and courting and pairing up. Again I got some nice shots and what turned out to be some of my favorite pictures of the whole trip of black winged stilts. A very good morning topped off with a few gharial and mugger crocs on the way back. After lunch we headed back into the countryside, this time in the opposite direction to the cranes, to look for blackbuck antelope. 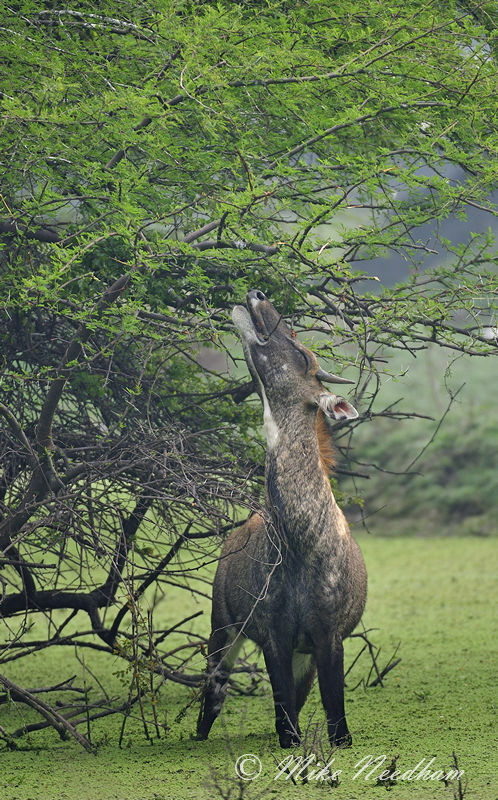 It was similar to the blackbuck spotting I did at Ranthambore in 2009(only the crops were greener and much higher this time) and the sarus cranes of the previous day. We soon got our first, and as it turned out only sighting, and I got a handful of reasonable shots. Certainly better than I had achieved at Ranthambore. The light was changing, the cloud cover thickened and so I decided to head back. I had hoped for some lovely golden evening light but today it was not to be. On the way back we were driving down a country lane when the driver suddenly stopped, as we started to reverse the guide said that there was a jungle cat! Jungle cat? We were driving through wheat fields and the like; I could barely imagine anything less ‘jungle’. But, sure enough just back from the road on a foot path cutting into a field of wheat was a jungle cat having a late afternoon pre-hunt rest. I got a few frames from the vehicle before trying a closer approach on foot. However, no sooner had I got out of our vehicle than a local bus pulled up right at the end of the path the cat was on, the locals were oblivious to the cat and were jumping out of the bus making lots of noise only a few feet away. It might have tolerated me on foot but this was too much and the cat slipped away into the dense crops and with it my pictures. That night I had a dilemma. When booking this leg of the trip I had kept my options open for the last morning at Chambal such that I could, if the gharial, skimmer, crane or blackbuck had been unsuccessful so far, have one last attempt at any one of them. In reality I had got reasonable pictures of each of them so which should I go back to? I quickly ruled out the cranes or blackbuck, both may be photographically productive (especially the cranes which were amazing to see at 5-6ft tall and would be amazing if there was a morning mist) but the river was a much nicer experience than the farmland. So, gharial or skimmers? The skimmer pictures that I had were less successful than those of the gharial, and if the morning was overcast the gharial would not come out to bask, so I went for the skimmers. Big mistake! The morning started well enough with a sighting of a striped hyena whilst waiting for the boat to join us, my first ever but the light was too low for a picture, but was otherwise very unproductive and I got little worth keeping. What made it worse was the fact that it was the warmest morning so far and so the gharial were probably out in force but in the opposite direction. But, you make your choices and take your chance....... Overall the Chambal leg of my trip had been a big hit and I was on a high for Kaziranga, feeling that the whole trip had already been a success regardless of what Assam had in store. And Chambal had one last treat on the way back in the boat. Another Jungle cat! On the same bank of the river as the first one, but too far further down stream the guide thought to be the same one. 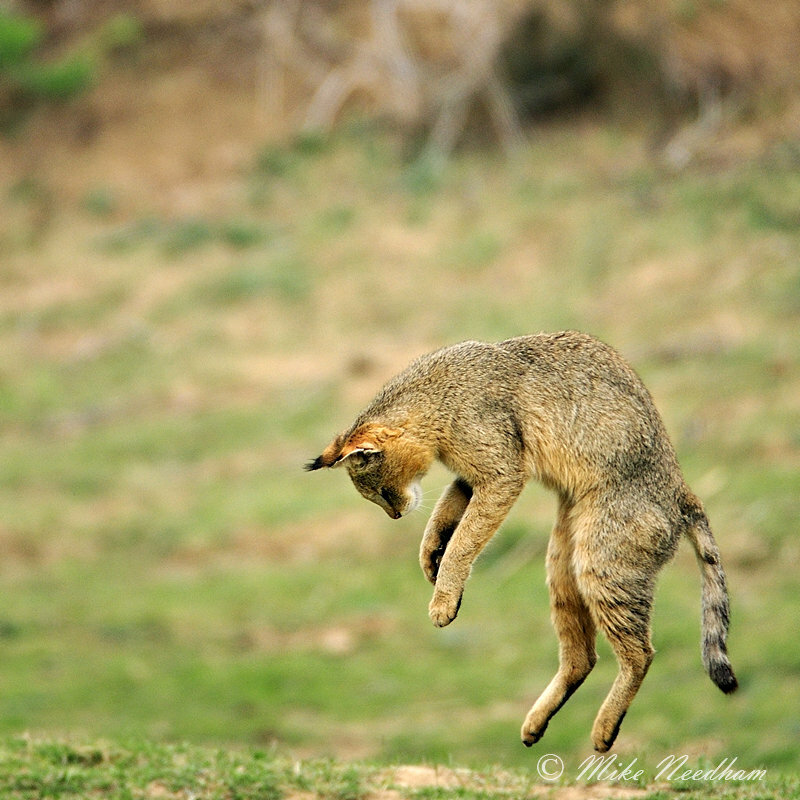 This one I watched stalk, crouch and pounce, all 4 paws in the air. It missed the mouse or whatever it was after but a lovely sight none-the-less and a great end to my first week. After lunch we set off for the 7 hour drive back, through Agra, to Delhi to meet up with John and the Photographers on Safari group just in time for a late dinner. If you ever plan to do Bharatpur and / or Chambal river by road from Delhi it is worth noting that you pass through Agra, home of the Taj Mahal. I had been during my 2009 trip and so made the decision to focus just on wildlife this time but, if you have not already seen it, it is certainly worth planning in a few hours to see it. I saw it at sun rise in 2009 and it was amazing, even for a sceptical wildlife nut like me. 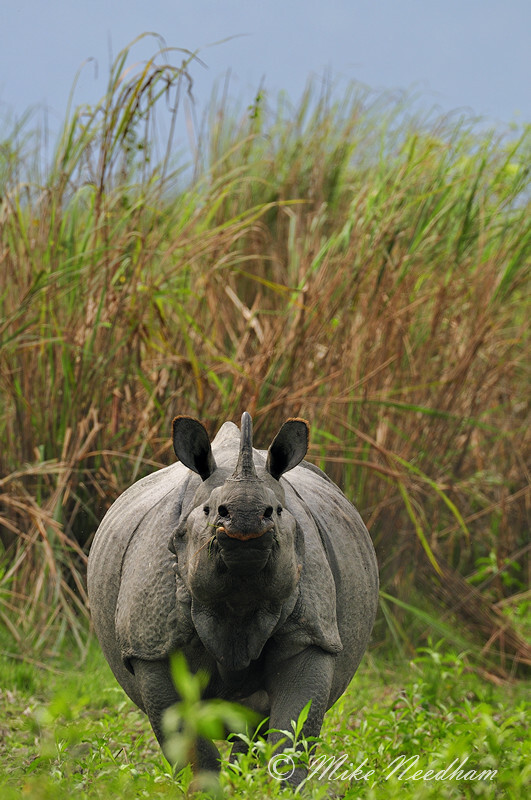 To cut to the chase, Kaziranga was like ‘rhino soup’. It got to the point after a couple of days where we would see rhino next to the road and simply drive on past if the light or background was not to our liking. How mad is that? There are only four or five thousand of these majestic animals left in the wild. Still, there are over two thousand of those in this one park and they are most certainly not particularly shy in the main tourist areas (a different matter in some of the less visited areas). Sadly the same cannot be said for the tigers. A couple of tiger sightings were had during the week by others in my hotel; I did not get a stiff. But after Bandhavgarh and Ranthambore in 2009 I was not concerned, I was just happy to be there in such a beautiful place and see the rhino, barasingha (another rarity, probably more so than the rhino), etc.. I had gone specifically for the rhino, to see a tiger there was always going to be a very long shot on such a short visit despite the park reputedly having the highest wild tiger density in the world (and well over 200 individuals). The habitat of primarily elephant grass kept them invisible to us, although I am sure that we must have passed within just a few tens of metres of one at some point. Indeed I was especially happy to still be there after being charged by a rhino on the third morning. There were some tall concrete observation towers about 4 stories high scattered round the park, usually by water, which you could park beside and climb (steps, very easy) to get a high view. On the first morning we had gone to one of these and seen rhino close-by in the elephant grass and wild elephants a little more distant in the water. Fabulous! So on day two we made a route straight there but when we got to the tower, nothing! We left and carried on looking. On the third morning we assumed that our early success at the tower was a fluke but eventually happened to pass close by and so we made a quick chance stop. There was very little around but as we were about to leave a rhino was spotted coming through the grass and heading for the waters edge close to the tower. The group started taking pictures. Having already got lots of great rhino shots the birds eye viewpoint did not really appeal to me and so I did not join in and, after quickly studying the rhinos 'trajectory' and the lie of the land, I estimated where it would exit the grass and where I could safely get a ground level shot from without disturbing it. So I exited the tower and got settled a little way around the shoreline (but not too far from the cover of one of our vehicles) opposite where I thought the rhino would emerge. A couple of minutes later I could just see its outline through the grass and was getting set when I heard a rustle beside me. I turned, it was John. I guess he had seen my plan and had decided to join me. He was quickly and quietly in place and I resettled myself just in time for the rhino's emergence from the wall of grass. Just at that moment two other members of the group started making a commotion trying to join us and get ready for the 'action' clearly not wanting to miss out, or understanding the need for stealth (or potential danger of their actions). They got more than any of us planned for! The rhino's head went up, clearly startled and not happy. It ran towards us. It started out about 20-25m away and closed a third of this seemingly in the blink of an eye. Everyone scattered. Our armed guard started waving his rifle around, clearly flustered and not knowing what to do. All I remember thinking was "whatever you do, DON'T shoot the rhino, if you have to do something shoot one of these idiots instead". In fact I seem to remember I shouted something along those lines at him at the time, not that he would understand (how embarrassing, sorry everyone who was there if you are reading this, although in the confusion I doubt anyone herd me). The commotion clearly startled the rhino stopping it in its tracks, giving everyone time to get back to, and up, the tower whilst the rhino considered its next move. I don't know about the rhino but our pulses were certainly racing, and I suspect that the guard's more so than most. The rhino snorted and trotted back into the grass. We left too! When I got back to the hotel I immediately went to check my pictures. I had stopped (for no more than a second) in the middle of to commotion to get a few frames of the rhino in 'angry mode'. What I didn't realise at the time was that the rhino had been feeding as it went and had come out of the grass with a mouthful of food. My angry, aggressive rhino pictures actually looked more like a gentle grass eater on an afternoon stroll! A fabulous experience nonetheless and on reflection far less deserving of adrenaline production than was the case at the time (the vehicle was very close by). One afternoon we stopped at a different tower and from its base I counted 23 rhino in the distance scattered around the water and beyond. About 1% of the parks population and about 0.6% of the world's wild populate in one view. The park continued to produce for the duration of the stay and came up with some little gems aside from the rhino. And one not so little gem! Each day followed a basic pattern; out on elephant back before sunrise, jeeps until mid / late morning and then back out in the jeeps for the last few hours of daylight. The early elephant sessions ran in two shifts, one after the other, and we tendered to do the first one for the early light. However, and I don’t remember why, one morning went elected to go out on the second shift for a change. This meant that we could hang around a little and watch the captive elephants drinking and bathing in the river after their morning’s work. At this point it was still only about 07:30 which gave the opportunity for some lovely lighting on them, including backlit dust bathing. 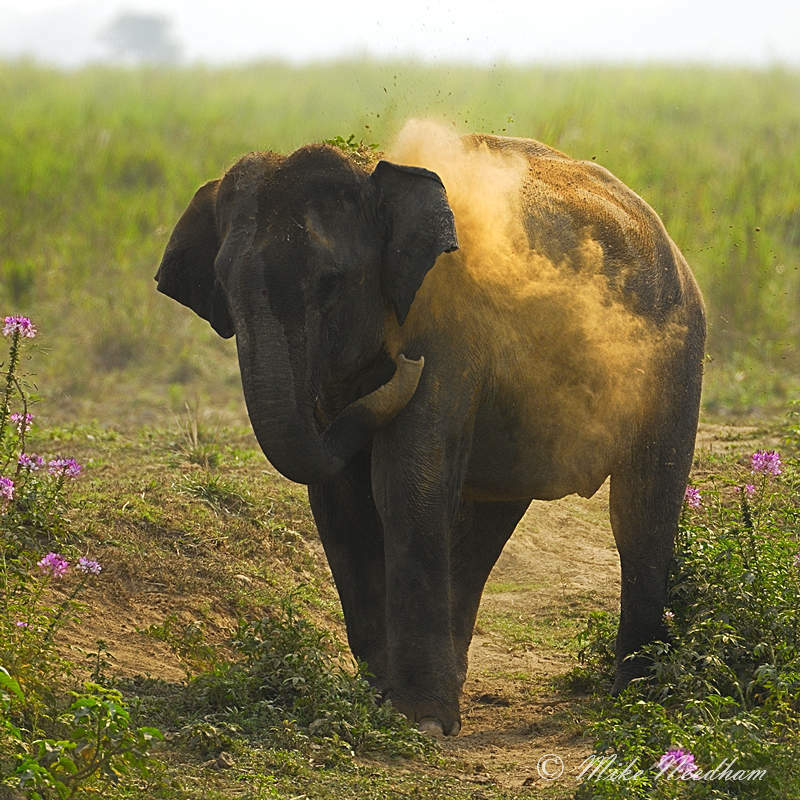 The elephants were not wild, although I did photograph a number of wild ones too, but the results were very nice and natural looking. To top it all, one of the youngsters (the young ones are left to roam free as they never venture far from mum) walked up to me and started to gently investigate my camera as if to admire it, clearly a Nikon fan! 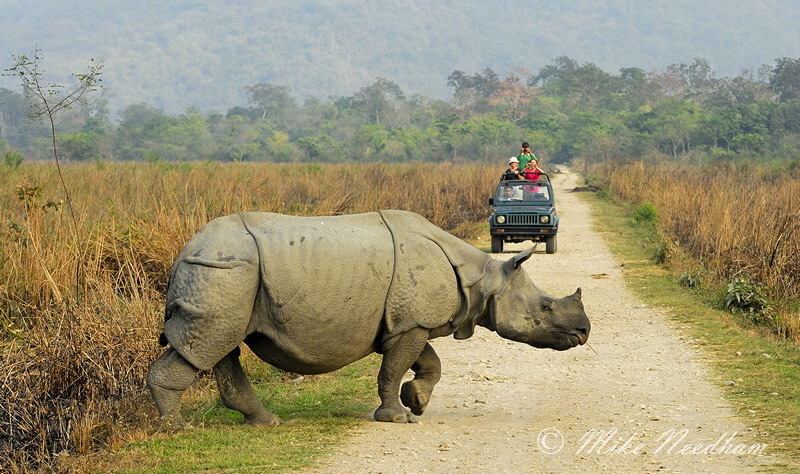 Amazing Kaziranga! It is a fabulous place and if you ever go to India I would highly recommend it. It is well worth the long travel to get there and is a very different experience to the other regions that I have visited. Overall a very enjoyable and productive trip from which I brought home just short of 260GB of raw images! Clearly most of these were deleted but it was not a trip where pictures were hard to come by if a little thought and effort was put in. Don’t forget to make it clear to your guide, or anyone else who will listen, any particular interests or local specialities you may be interested in. Especially if they are a little off the mainstream. 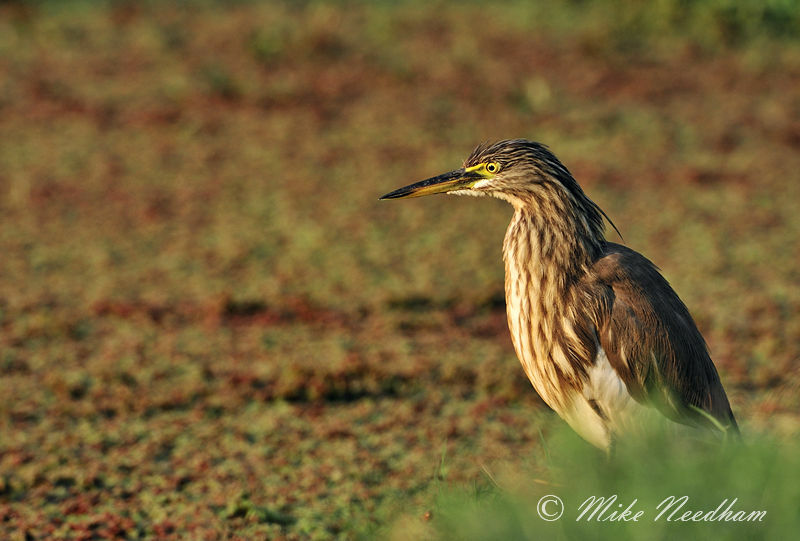 During initial discussions with my guide at Chambal River I made a point of telling him that I would be interested in seeing anything wildlife related that I could get close enough to for photography. 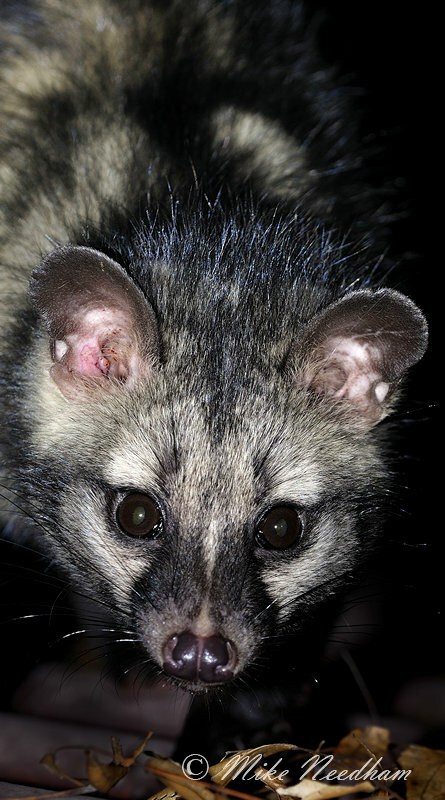 This immediately paid dividends as he explained that most nights “civet cats” (actually nocturnal Indian Palm Civets) visited the kitchen area at the rear of the lodge (usually out of bounds for tourists) and we could try to see them that evening if I was interested. Obviously I was! This approach often gives additional opportunities and the guides like to share their local knowledge with the more interested visitors. It does not always work out to plan however, the same guide left it until we were returning from our final trip to the river to tell me that there was a colony of fruit bats on the edge of the hotel grounds. I took a look but the midday light was much too harsh, the previous evening I would have got some nice shots if only I had known. You win some, you loose some! My primary objective of this trip was to fulfil two long standing ambitions. I had been loosely discussing with John from Photographers on Safari my desire to photograph the Indian rhino in the wild for some time, so when he put this trip on I knew it was for me. 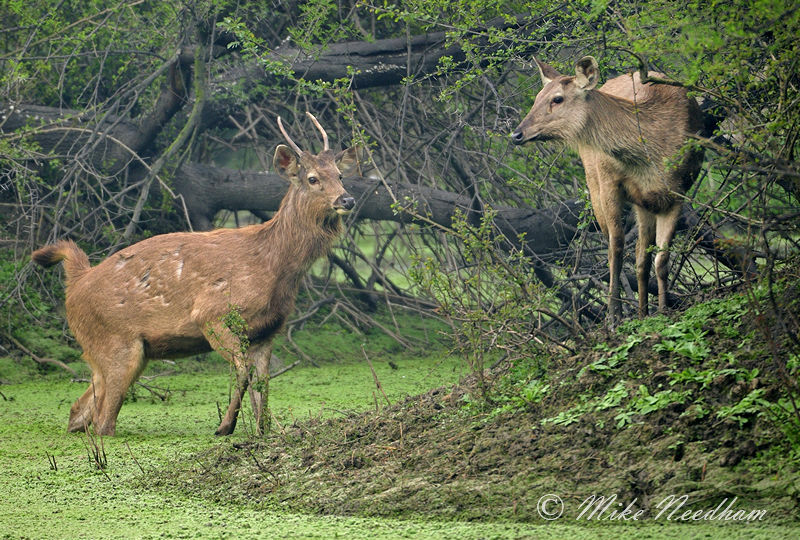 Especially as it offered the best opportunity of photographing rhino coupled with a chance of seeing barasingha. The trip to the rhinos was meant as a supplement to one of John’s excellent tiger trips, but having been on one of these a couple of years earlier (see India 2009) I passed on the tigers and decided to do something different on my own to supplement the rhino leg. With the help of Wildlife Trails I organised the trip to the Chambal River Sanctuary to shoot Gharial, an amazing rare crocodilian endemic to India and the other of my longstanding ambitions to be fulfilled on the trip. 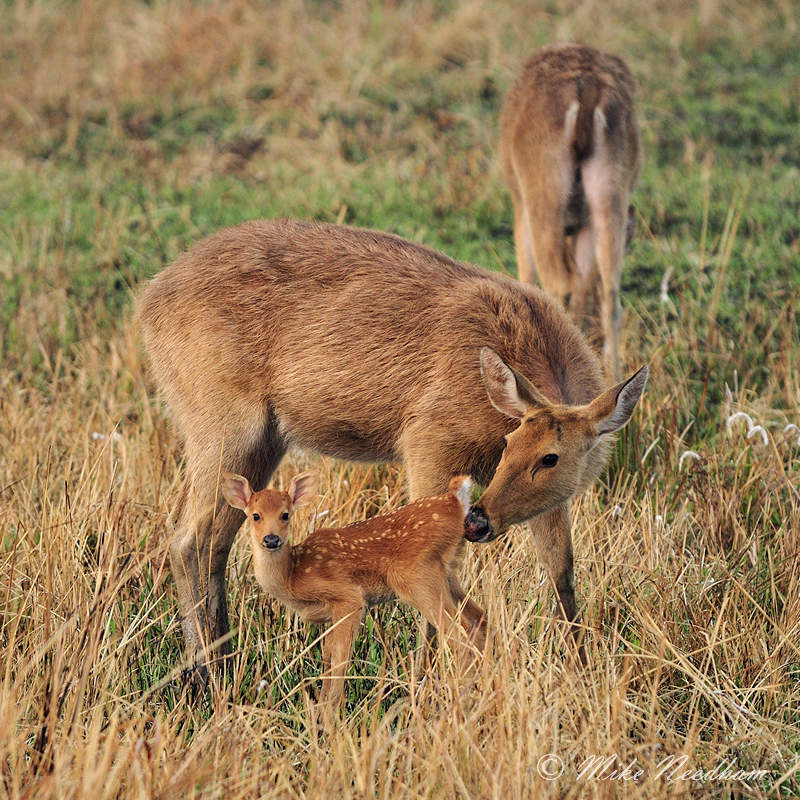 This also gave me the opportunity to try to get shots of blackbuck antelope, Indian skimmers and sarus cranes, and to stop off at Bharatpur on the way. It would be busy, but it was a mouth watering opportunity not to be missed.